I first discovered this book by Max Lucado last year while unpacking the boxes in my husbands office. The message is simple enough: We love, because He first loved us. (1 John 4:19 NASB) However, the application is much more complicated than that because, honestly, it can be difficult to accept that a perfect God can love us imperfect humans so completely. I can’t fully explain how much this book affected my outlook on love through the first year of marriage. A Love Worth Giving asks the question: how can we truly accept and reciprocate love from the people in our lives if we’re not first receiving and returning God’s love for us? The hard truth is, without Him we’ll always fall short in our efforts to love. Of course, this is nothing new. We’ve all heard it dozens of times before. It was an idea we talked about with the pastor before we got married, but this book digs deeper into how far we can take His love in our relationships. “Living in the overflow of God’s love,” the book’s subtitle describes is perfectly. While reading, I realized just how much more I could love my husband – and family, and friends – if I was taking time to fill myself with His love too. Yes, it would have been easy begin building our life together on that newlywed bliss, but I’m thankful that I stumbled upon this book just days into our marriage. It challenged me to go beyond that fairytale love (which, don’t get me wrong, is a wonderful thing) and work to pour God’s love into our relationship from the beginning. Even if you have wonderful, deep relationships with everyone you know, I recommend picking up this book just to see how much more you can give when you’ve got an abundance of His love in your life. I was having a hard time coming up with what I wanted to blog about today. At first I was going to talk about the “autumn-izing” of my apartment but then work ran late and decorating my apartment didn’t seem too appealing. So instead I surfed the internet and found the 10 Best Fictional Boyfriends List at thoughtcatalog.com and was inspired. Also known as the original best boyfriend. Who couldn’t help but fall in love with this silent, brooding man? He’s rude, snobbish, and has too much pride sometimes yet he falls so hopeless in love with Elizabeth Bennett that he saves her family from ruination even after she rejects him. It is truly is the ultimate love story. Men can blame him for the high standards women have. Who cares about the red hair? 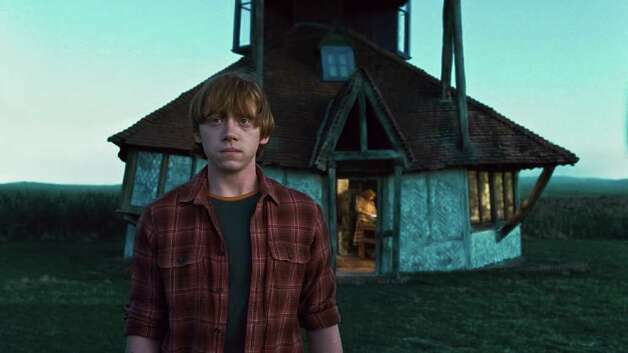 Ron Weasley is hot… and funny, and smart, and loyal and comes from a loving family. What’s not to love? Okay so maybe he is quick to judge and that can test his loyalty aka the Goblet of Fire and most notably the search for the Horcruxes, but he came back. That’s what counts right? And while it may have taken him a couple of years to realize Hermione was a girl and a couple more to kiss her… his feelings for her were pretty obvious from the start, even when dating annoying Lavender Brown. Ron Weasley for King. He’s got my vote. Oh the boy with the bread. How can you not love the boy with the bread? He purposely burned bread to give to Katniss Everdeen although he knew it would lead to him getting punished. In his world that is sacrifice. But then he makes the ultimate sacrifice and is willing to let Katniss win the Hunger Games because he loves her that much? Why can’t we find guys like that in the real world? ! I’d take bread from Peeta any day. Okay so I know he is gay. I get it. However you have to admit that he is a pretty awesome boyfriend. He switches schools for the man he loves (I mean it’s only high school so you can only do so much…) However he does encourage his man to go pursue his dream in New York while he finishes his senior year in boring Ohio. Devotion and hotness, great combination. While we never saw Luke in a boyfriend role we can imagine. And you would imagine he would be a great boyfriend right? I mean he risked his life to save his sister so can you imagine what he would do for the girl he loves? Probably a lot… I would say try to save the planet but he rid the galaxy of evil so there really isn’t a good step up from there , is there.? I would take Luke Skywalker on a date. Sam Hall’s love story got mixed up into the whole world coming to an end thing in The Day After Tomorrow but it’s still there! He joined an academic knowledge bowl team for the girl he liked and then willing flew on a plane (he has aerophobia) for said academic team and girl. Plus he risked the cold and wolves to get medicine to her when she got sick. That’s going the distance. I think I came across very few boys/men in high school who would do that for a girl they really liked. He was the original boy with bread (sorry Peeta!). And he had a monkey, genie, and magic carpet. Talk about cool. While I don’t think you should have to change who you are to get a person to like you I understand while Aladdin did it. I mean he was trying to win the hand of a Princess. That takes some serious moves. In the end Princess Jasmine picked him after she found out he was just a “street rat” and he saved the Sultan and kingdom from the evil Jafar. He is cute, loyal, and can sing. Aladdin proves that love can conquer all and cross all social and economic lines, so profound for a Disney movie. My favorite Disney Prince ever. My favorite Audrey Hepburn movie is Breakfast at Tiffany’s and part of it has to do with Mr. Paul Varjak. He is the cute, caring, quintessential boy next door. Ms. Holly Golightly is not into anything permanent (that’s why her cat is named Cat) yet Paul is on a mission to make Holly take some responsibility for her life because he loves her and that’s what you do for the one you love. He even loves her through her crazy quest to marry men for money. In the end his love for her gets her to examine her life, settle down, fall in love, and finally name her cat. Go Paul. Last but certainly not least is Josh Lucas from the 90’s classic Clueless. While it is slightly creepy that he has a thing for his high school step sister all in all he is dreamy. I can see why Cher picks him. He is smart, soulful and seems to be that one wealthy man in the world who is also humble and kind. A crazy combination! Plus, he is the modern version of George Knightley from Jane Austen’s Emma and you really can never go wrong with Jane Austen heroes can you? Do you agree with my list? Who would add to the list? Today’s workout started out with some with some treadmill time. Like I said early I get really bored on the treadmill so I try to change it up while running… today was similar to last week’s workout. I also did a little circuit work after the run. 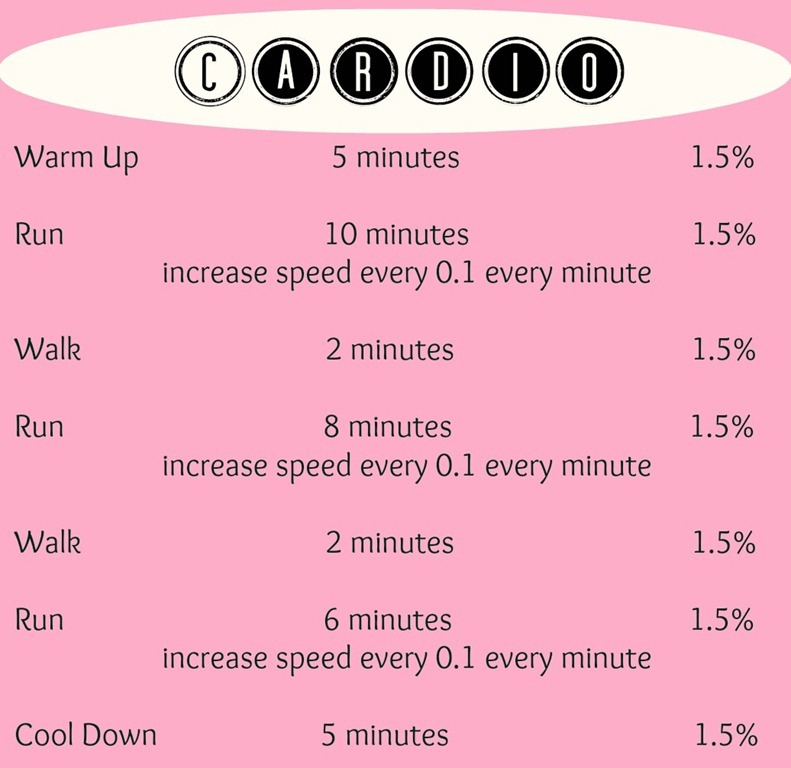 Since I’m not a big runner I usually get it out of the way first but you can do the workout in any order. I keep the circuit simple with easy moves that are really common. 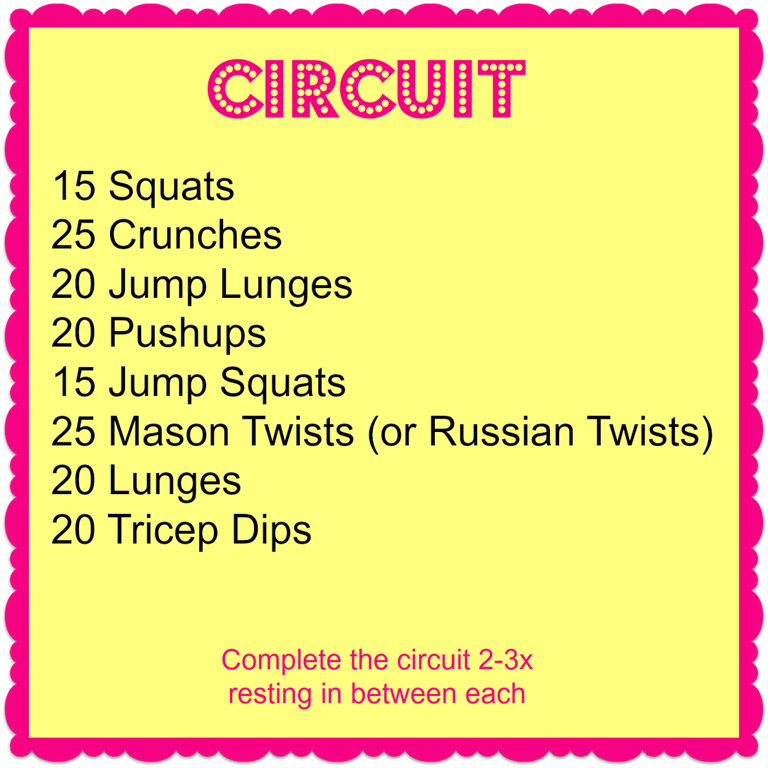 I would recommend doing the circuit 2-3 times depending on how you feel, I know some days I’m just done after two rounds! This weekend I was inspired. Well… sort of. While flipping channel I came across the movie Julie and Julia, the move that chronicles a women (Julie) as she tries to make all 524 recipes in Julia Child’s cookbook in 365 days. After watching the movie I was inspired to cook! A disclaimer to this statement however is I do not cook so my attempt to cook may (most likely will) seem very feeble and amateur to most of you but it was a huge accomplishment for me! 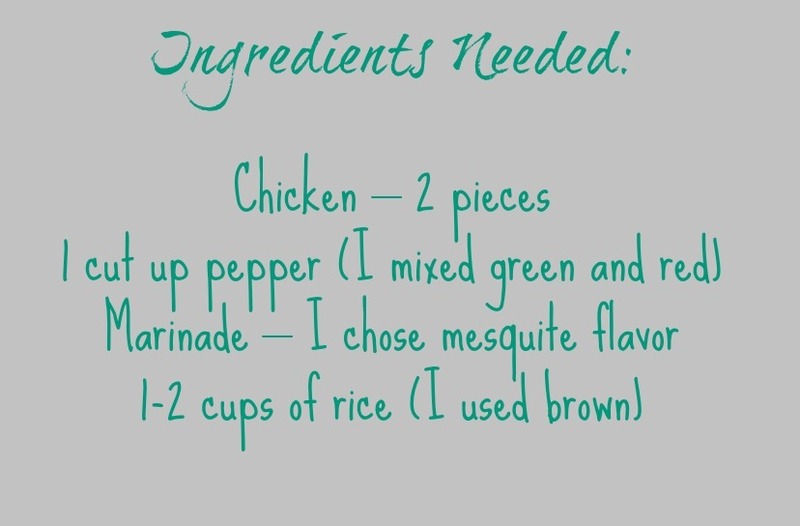 I decided to make something simple with ingredients I knew I would like (I’ll eventually branch out later…) so I made a chicken dish. First, I put the chicken into a bowl. I then poured the marinade over the chicken, making sure I covered the whole chicken. I then covered the bowl and stuck the chicken in the fridge. 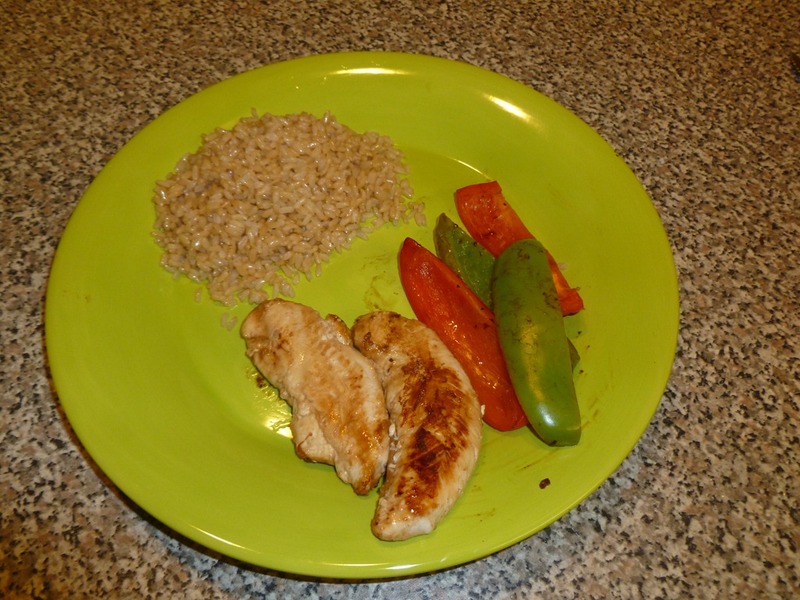 I let the chicken marinade for about 30 minutes, during this time I cut of the peppers and cooked the rice. 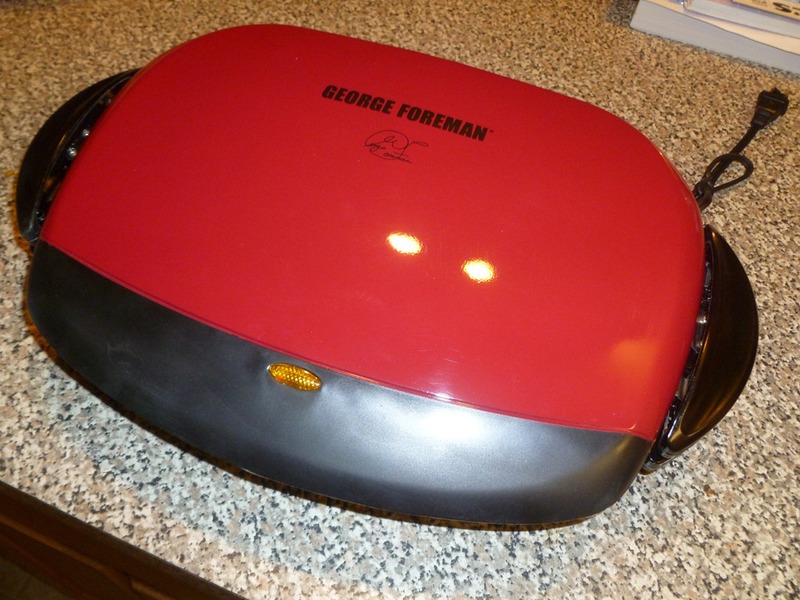 I then used my spiffy new George Foreman Grill to grill the chicken. 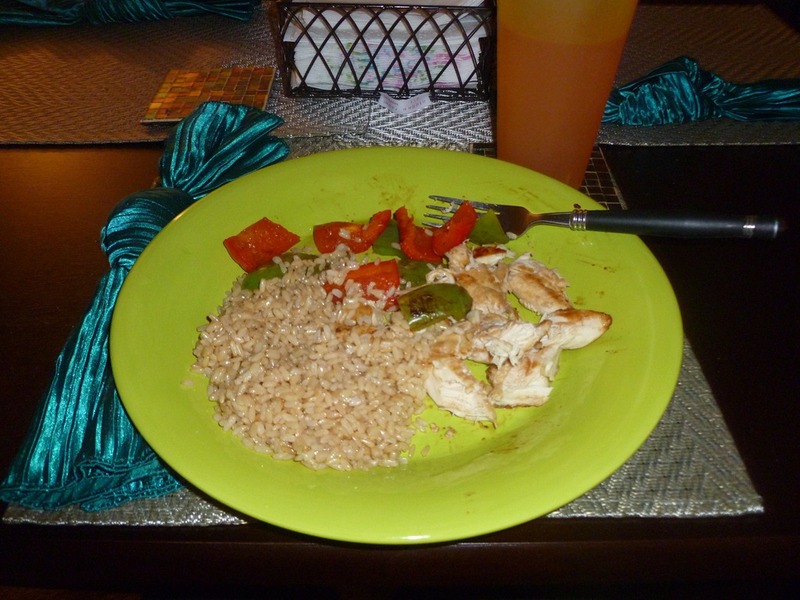 While it is a really simple dinner I am super proud of my accomplishment! Hopefully sometime soon I’ll be able to branch out into more adventurous recipes! Are you a good cook? Or are you like me and proud to not burn the chicken? 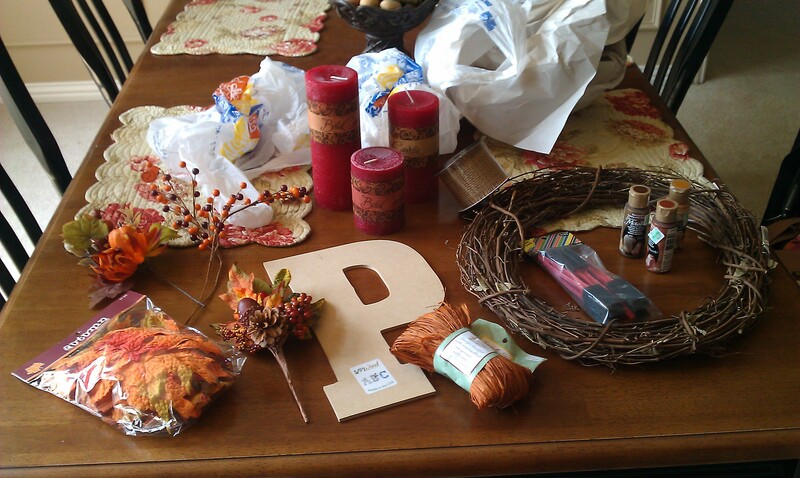 I have a tendency to go overboard at Hobby Lobby. There. I admit it. I’m a craft addict. Now, someone find me a support group or a self-help book or something. Anything. I really do go supply shopping with a specific project in mind, I promise, but then . . . well, then I’m in Hobby Lobby, unsupervised. I blame it on the purchase of my first hot-glue gun. Bought it for one little book wreath, and it’s been all downhill from there. Oh, what if I added this ribbon . . . or these cute little pumpkins . . . and these candles are on sale . 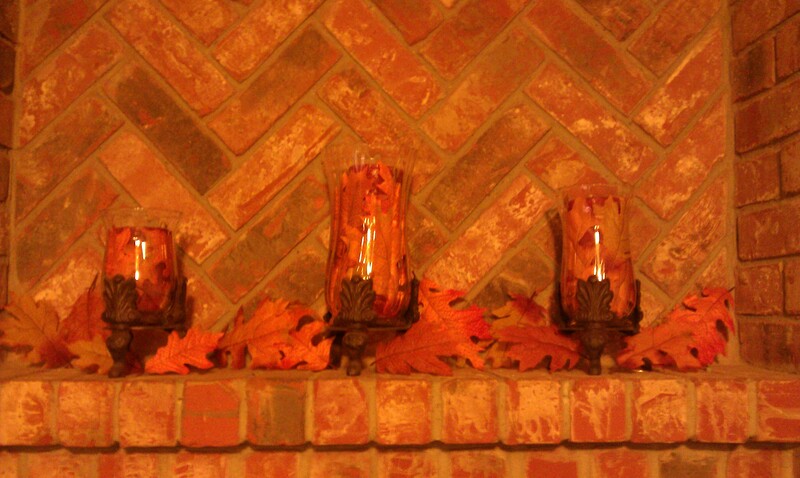 . . maybe I’ll redo the mantel too. Long story short, I came home with all of this. In all honestly it could have been a lot worse. So, here are the results of my weekend crafting binge. Ta da! Project 1. Leafy “P” isn’t going to live up to my expectations. 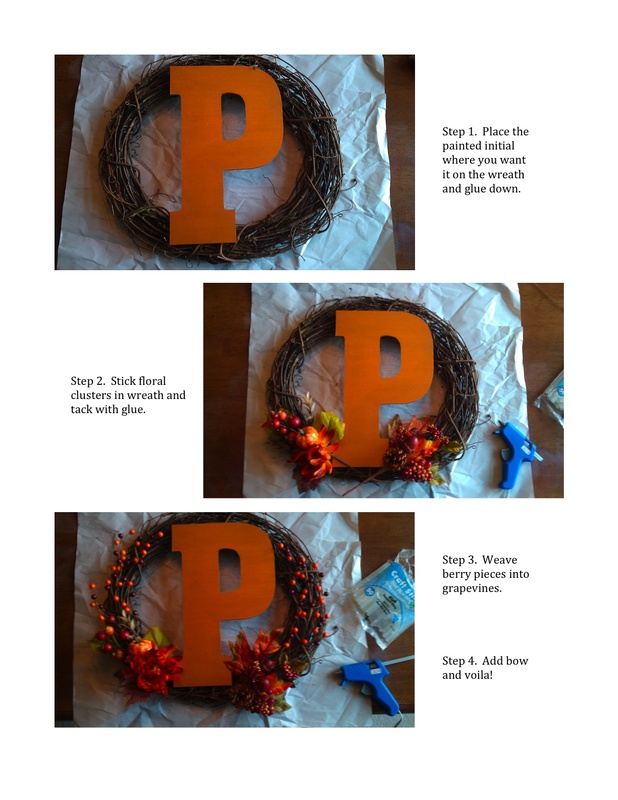 Make autumn wreath instead. 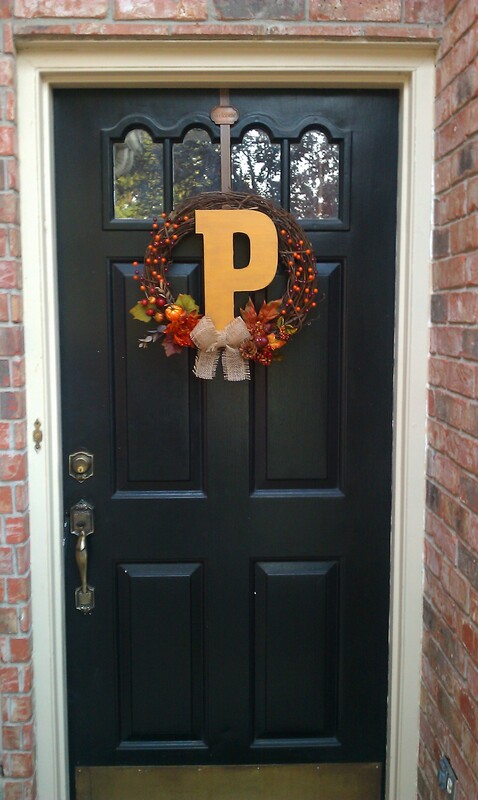 Hint: Grapevine wreaths are super cheap and they make creating fabulous door decor easy! See . . .
Isn’t it pretty?! I sure hope so, because it’s on display for the whole neighborhood to see! Now on the the rest of my weekend DYIs . . .
Project 2. 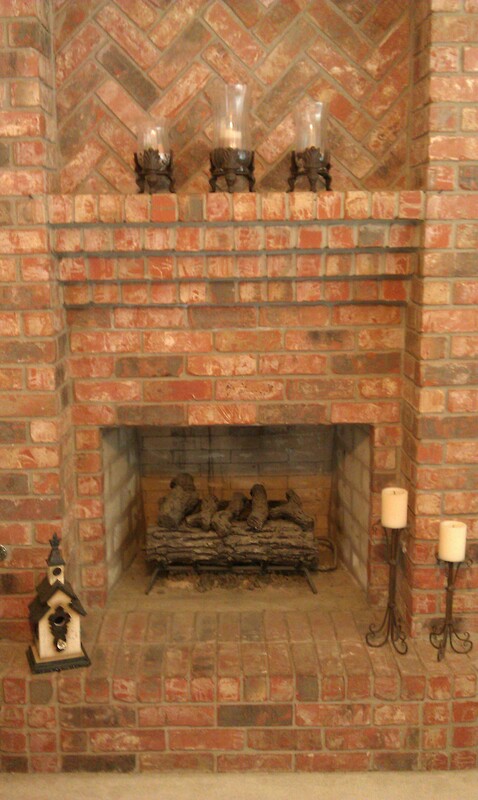 Redo the fireplace, just because I can. Redo Step 2. 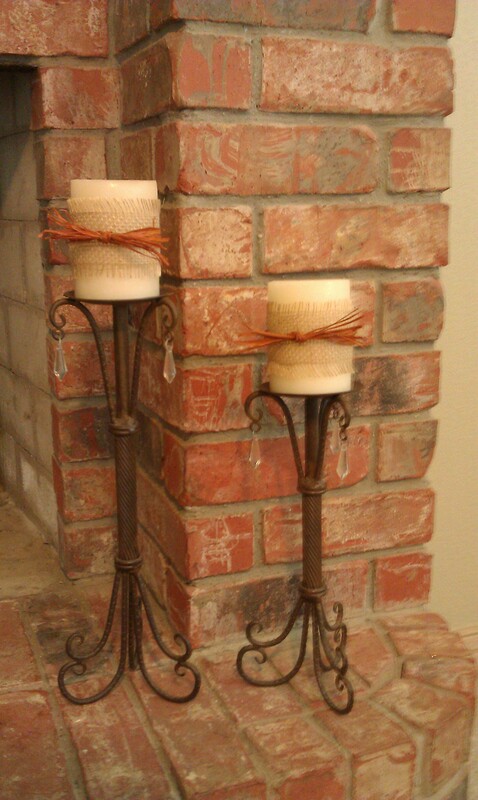 Add new candles to hurricanes and use leaves meant for originally planned DIY. Ta da! As you can see I only got slightly carried away. (I’ll spare you the crazy until Christmas-time.) Hope you’re all inspired to decorate your own homes for fall too! I didn’t notice at first but that little bit of time listening to inspiring songs put me in a better mood for the rest of the day. (It also reminds me to be forgiving in the insane Texas traffic!) I have to admit, I’ve never really listened to Christian music outside of church and Phi Lamb worship. Even after months of listening to this station on the way to work I couldn’t tell you who most of the artists are; but that’s not what’s important, is it? It’s been just relaxing to start my days out with God and a good cup of coffee. Part of the reason I love this station is a short segment they do called The Family Minute with Dr. Bill Maier from Focus on the Family. They share advice on everything from marriage to parenting to faith, and one piece in particular from a couple of weeks ago has stuck with me. It’s called “Backpacks and Burdens.” You can listen to the full segment here (it aired on 9/10), but I’ll give you the basic run down. Maier compares our struggles to physical burden we carry with us. 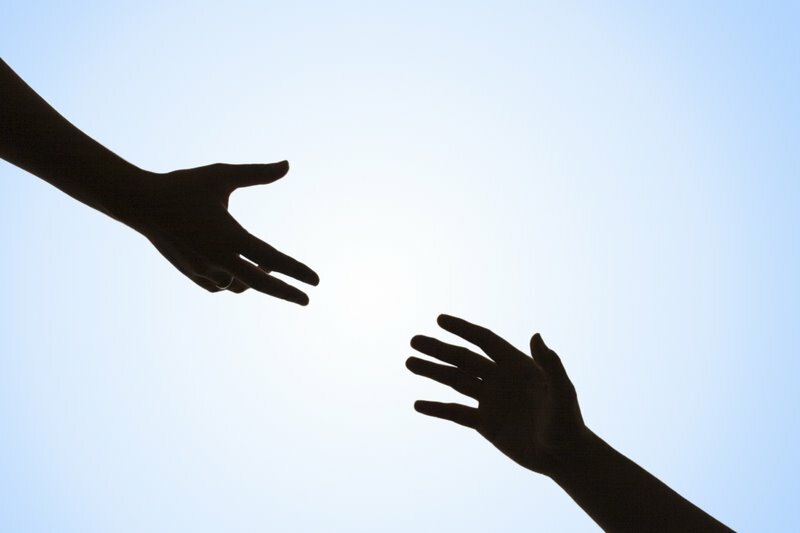 We trudge along and sometimes forget how even a small bit of encouragement can help to lighten the load. The message would be encouraging in and of itself, however it made me realize something about myself. I do not always allow the people in my life the opportunity to offer their support. It served as a great reminder that sharing my struggles with my husband and family is not a bad thing. I don’t have to gripe for hours on end, but opening myself up to encouragement from others can make a huge impact on my stress level in this busy life. Does anyone else struggle with accepting support from others? I’m anxious to hear what you think of the Family Minute. Feel free to share your encouraging stories with us. We look forward to hearing from you! 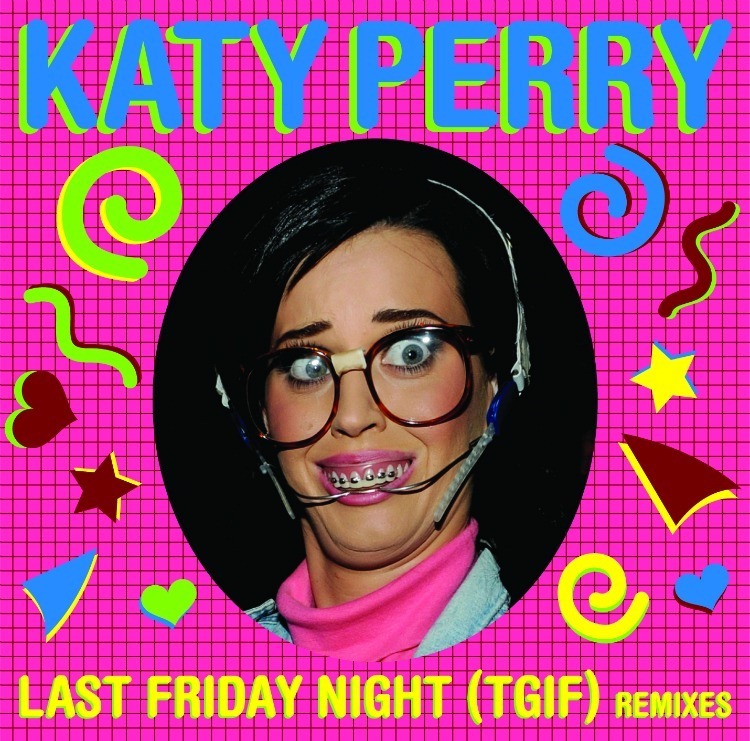 But remember… TGIF (Katy Perry)! Today’s post I’ve decided to do a little something different. A couple months ago I found this thing called 101 Things in 1001 Days floating around the blogsasphere and decided I wanted to jump on the band wagon too! So in July I created my own list and now I’ve decided to share some of it with you! 2. Go complete dairy-free for 1 week – No Cheating! 7. Eat Clean for 1 week – No Cheating! I decided to break my list into sections. (I’m an organization fiend so I’m sure its not surprise to those who know me). I’m sharing my food section with you because this weekend I’m going to try to learn 1 new recipe and start working on that goal! I’ll be sure to post updates whenever I accomplish something on the list! 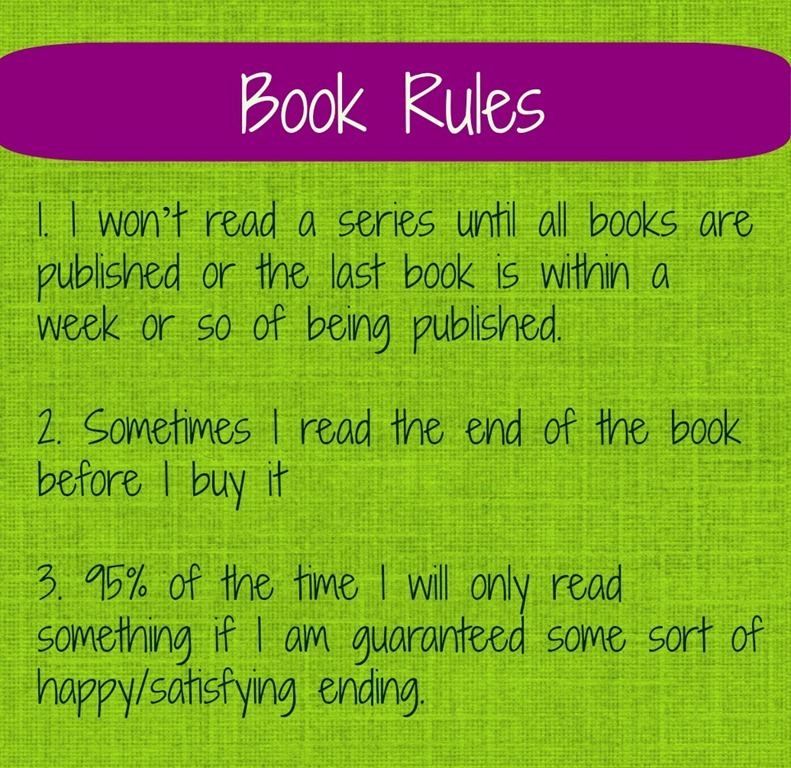 My list time limit will end April 17, 2015. Hopefully I’ll make a lot of progress by then! Do you have any exciting plans for the weekend or are you planning on just relaxing? Now that I’m all grown up (Shhh, we’ll just pretend that’s true.) I’m always asking mom for the recipes I loved so much as a kid. There’s just something about warm, familiar smells wafting out of the oven that just feels like home. This pumpkin bread is one of those favorites. The original calls for nuts and raisins and I like it that way, but the husband? Not so much. 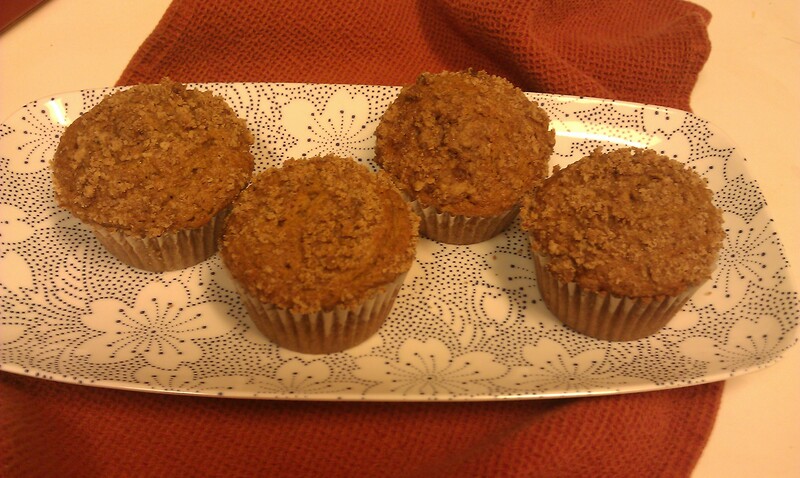 So for his sake I added texture with a basic streusel on top instead. 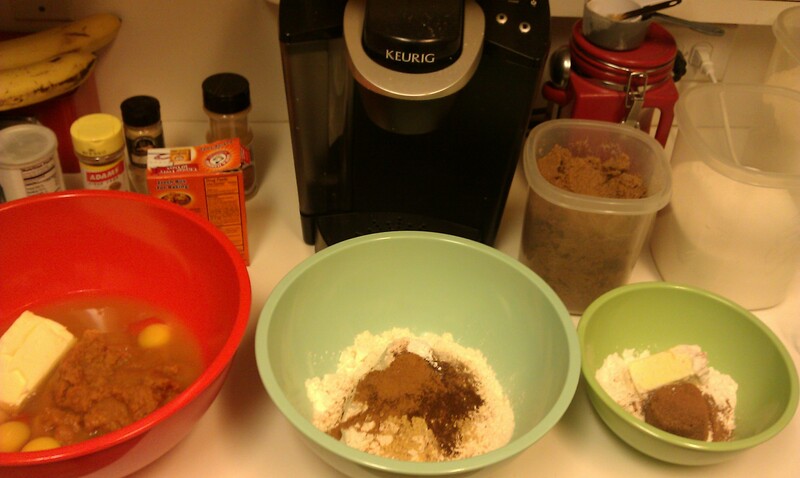 I also decided to spice things up a bit, adding nutmeg, ginger. Now, without further ado, my version of mom’s pumpkin bread. This will make two loaves or two-dozen muffins. 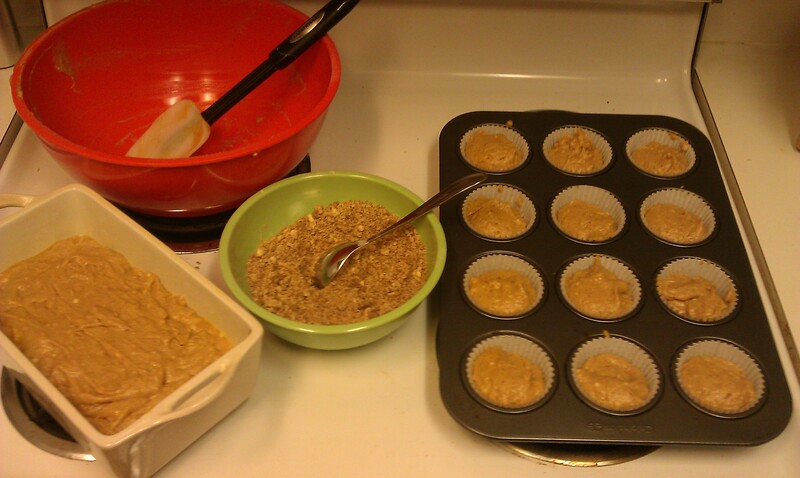 Bake at 350; 20-30 minutes for muffins and 55-65 for loaves. It’s done when a toothpick inserted in the middle comes out clean. Let cool and enjoy! But back to the present (or back to the past I suppose) so here is a copy of my workout from yesterday. 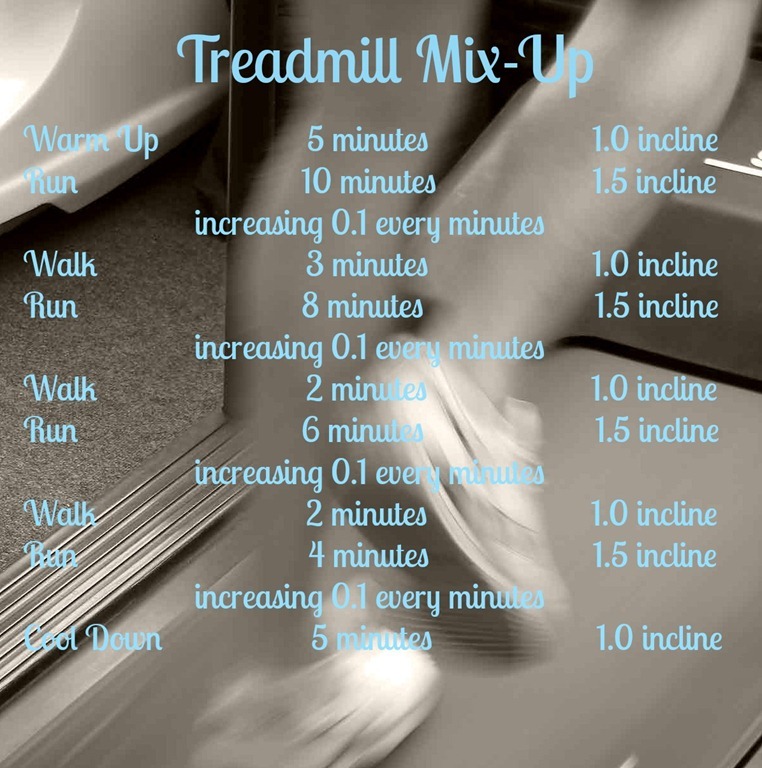 I’m not a big runner and treadmills are just so boring. Soooo I decided to switch things up a bit. It’s a fun workout that makes you work! Before you realize it you are speeding along! I’m pretty slow so I usually start around 5.3 to 5.5 and before I know it I’m up to the 6.0s and still going. A pretty cool accomplishment for me! The workout for today was going to go in this post too. That was the plan… however this nasty little thing called the Flu Shot got in the way. I’m usually good with shots but this one was no fun. So there was no workout today but I promise there will be one posted on Friday! See you then! Stay tune for Lauren tomorrow! If you think the above image is cool I can take very little credit. I used the site PicMonkey which is a free online photo editing site. All I did was copy, paste, edit and type. The site is awesome and I can thank Peanut Butter Finger for recommending it! When do you start daydreaming and planning your weekend? Do you start early (like me) on Wednesday or are you a spontaneous person and wait until the weekend and see were it goes from there?